A puppy has a lot of energy! If you have a small dog or puppy then you should consider an easy-to-move puppy playpen. If now is the right time for you to get a puppy, then you need a puppy playpen to make things go smoothly. Here are a few things to look for when deciding which one is right for you. Some puppies are tiny while others are the same size as some adult dogs! A chihuahua puppy doesn’t necessarily need a playpen that is the same size as that for a lab mix. If you travel or take your puppy to work with you this may be an additional consideration when it comes to size. Some pens are made of metal and some are plastic. The metal pens are stronger than the plastic ones and they are more chew resistant. 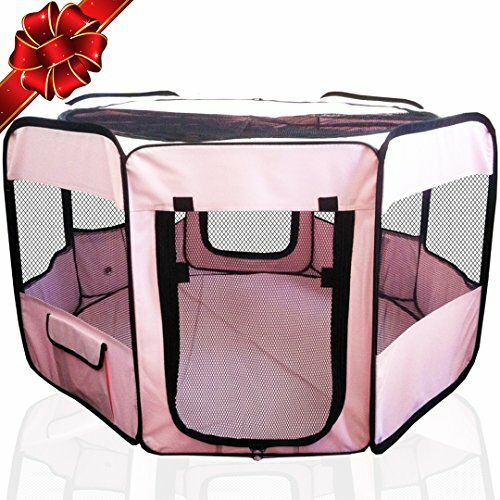 Soft playpens with mesh windows are great for travel and vacations. They are lightweight and can be stored flat so if you have limited space any way they are a good option. Soft playpens are not chew-proof, so you will need to watch out for destructive behaviors. You can spray some Bitter Apple Spray to discourage chewing but make sure to provide a variety of chew toys and treats for puppies to gnaw on. Soft pens are good for camping and travel. I would advise not getting the cheapest pen you can find. The whole point is to help contain a puppy! Cheap playpens may just come apart or break at a bad time. Some playpens are shorter or taller than others so this can be cause for concern. After all, puppies like to play and squirm! If you are trying to keep them confined this is a problem. There may be times when you just cannot have a puppy in a room when you are cleaning or you may have an infant or toddler that needs some supervision with the puppy. Puppies can grow fast so you need to consider this when getting a playpen. Height is definitely one of the more important size factors but diameter or overall footprint is important too. A crammed in pup is not going to be content and able to play. Some playpens are totally expandable because additional panels can just be locked in. You can also usually change the shape with ease to fit a space. 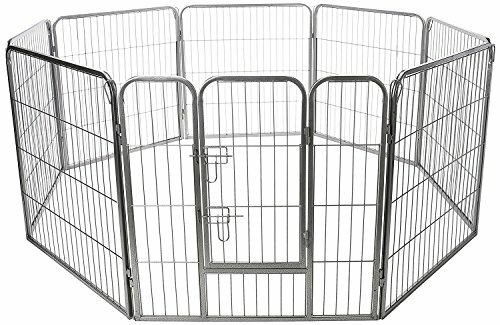 A puppy playpen is great because it is a portable fence option for those that rent and cannot fence their yards. It is an affordable solution that allows your puppy some outside time, as you can set it up when you are out gardening or relaxing while resting assured that your puppy can’t wander off. This encourages you to spend time with your puppy so they don’t feel left out. These interlocking pen panels create a space that measures about 28″ x 55″. You can buy as many sets as you want and put them together. The height is only 28″, so after a point, you would need to add another layer on top. I like that you can use the panels to create a top as well so that might be useful for containing puppies that like to crawl out and escape. For the price, this is a bargain in terms of function. 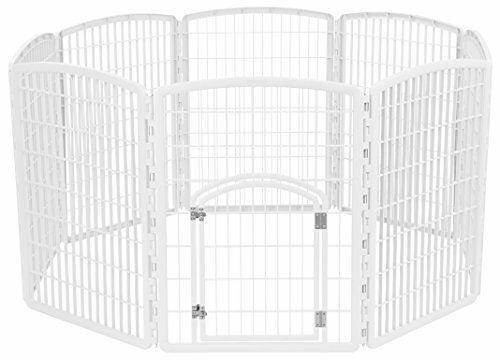 Each panel is light so you don’t have to sweat to set up a great playpen in little time. If you have other pets, this can be used for them after your puppy is grown! This soft playpen sets up in seconds and folds down flat for easy storage and travel. The eight mesh side panels provide visibility but helps keeps insects and the heat and sun off your pooch! The stash pocket allows you to keep some supplies at hand. There are three different sizes depending on your puppy’s needs. I like this pink color because it helps the pen stand out. This would be great for vacation or camping with kids. Honestly, I can see how this would make a good mobile play area for a toddler with some supervision. When I was little I would totally have played in this. This is a durable and waterproof pen that offers great protection from the sun while giving your puppy space. This metal panel pen is spacious enough to give your puppy some room to romp. I like that you can get this pen in many different sizes and heights. This means it is a good option for pet parents that have really big and tall puppies. As someone with a Great Pyrenees, I know it can be challenging to find products that are in any way suitable for large puppies. This pen comes in a 36″ and 48″ height so that is nice. You little dog parents can get away with the 24″ when they are puppies. 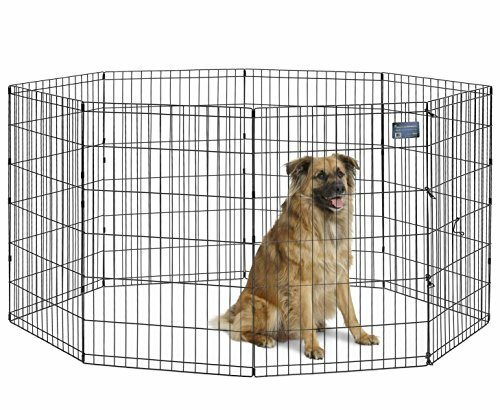 Leave it to Amazon to have a generic playpen that offers a good value and a lot of space for your puppy to play. These pens come with a door built in or without and you can choose what height to purchase. This provides the equivalent of 36 square feet of space for your puppy, which is plenty when they are small. The panels are easy to put together and made of sturdy-yet-lightweight metal. This is a beautiful pen and made of lightweight– but tough– commercial-grade plastic. The door makes it easy to secure your puppy. This is a playpen that can be used outside or inside and it looks so pretty that you won’t mind this pen being seen. The pen measures a full 63″ x 63″ x 34″ but you can buy sets of two panels and expand it as needed. This is one of the better plastic options, and I like that it allows for growth and custom sizing. Of course, you can also change the shape of it as needed. Oh, and you can choose a bunch of fun colors too! This product offers an easy to put together option and comes in a few different colors. 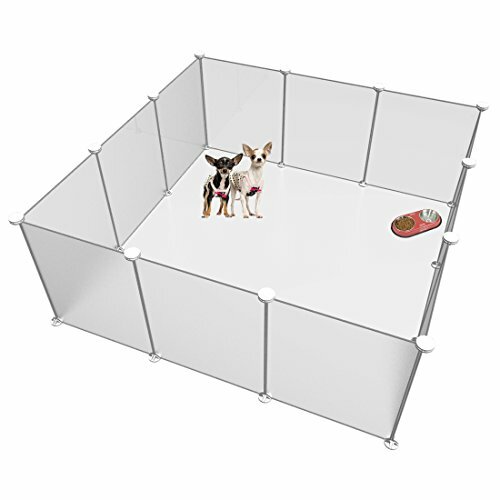 The playpen allows for eight square feet of space, but you can get two panel extension kits to make it grow with your puppy. The height is about two feet, so it is most suitable for small to medium-sized puppies. The door is included and you get stakes for attaching it to the ground for outside play time. 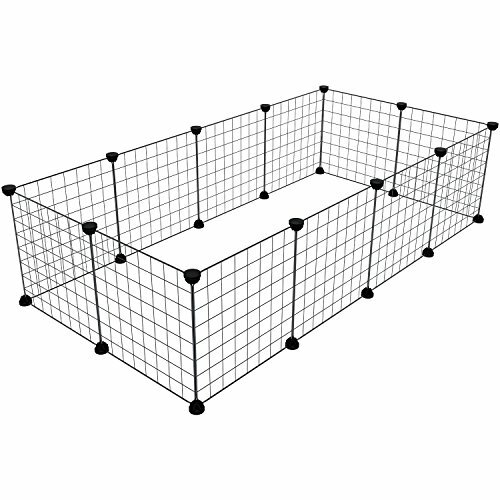 For a heavy-duty option for big and rambunctious puppies, this pen allows for 30 square feet of space and a 40″ height. You can set up panels in a square or octagon shape depending on your preference. The gate has sturdy latches so you don’t have to worry about creative escapes. This playpen weighs a little over 50 lbs but you can move it a panel at a time so it is manageable for most people to use. 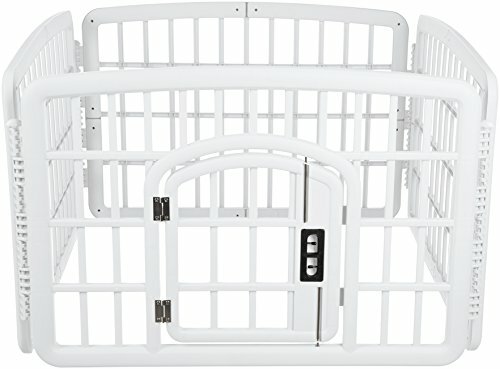 This is a budget-friendly soft playpen that you might want to consider even if you have a plastic or metal one already. It offers mesh windows and a sunroof that protects your puppy. 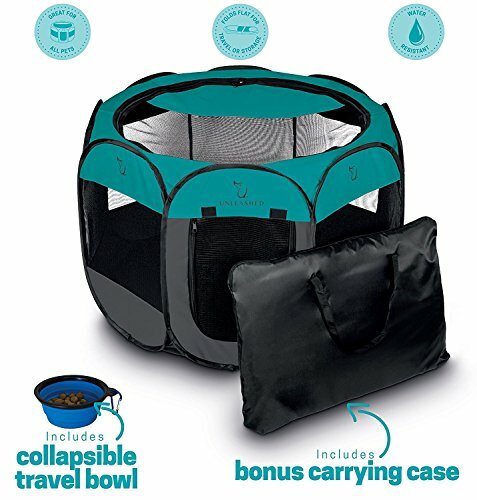 This durable waterproof playpen folds up into a bag that you will barely notice in your car or closet. 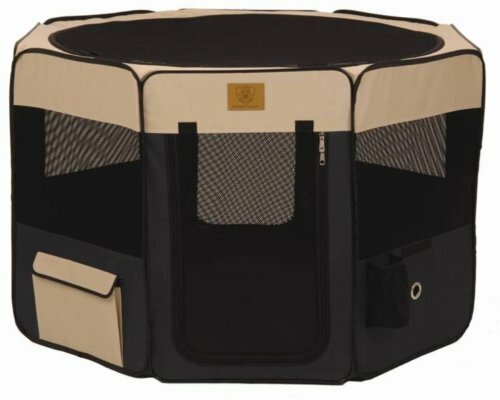 It sets up in seconds and with so many great reviews from pet parents, it is hard to ignore as a top choice for a soft playpen. As a bonus, it comes with a collapsible dog bowl for water or food on the go. This is a plastic pen system that can be made into cubes for storage. I kind of admire the versatility. As far as actually containing a puppy, this is only good for small breeds. You could even make a little house for them out of the panels. It easily snaps together and can be expanded as desired or stacked up and used for other pets. This kit gives you 20 square feet of space for your puppy. The size of your puppy and how rambunctious the breed tends to be are some of the more important considerations. If you have kids around, you may want to make sure you have a tall pen that can help keep puppies and kids separated. When I was a kid, a two-foot-high playpen would not have kept me from the puppy! 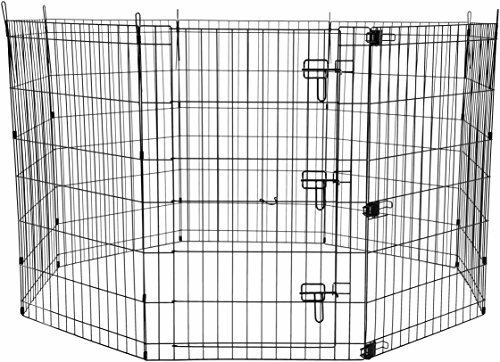 A puppy playpen is going to be a major help that first night you have your puppy. Instead of wandering around, they will have a cozy spot where you can put warm blankets and a bed and help them get through those first days after being taken from their first home.